VICTORIA HALL - THE JUNE 1883 DISASTER. The 'Victoria Hall' disaster of Jun. 18, 1883, in which 183 children died. The 'London Times' coverage of the 1883 disaster. A part of the 'Illustrated London News' graphical coverage of the 1883 disaster. A part of the 'The Graphic' coverage of the 1883 disaster. The coverage of the 1883 disaster in the French 'Le Journal Illustr�'. What we know about 'Alexander & Annie Fay', the conjurors who performed that day. The earlier & later 'History of Victoria Hall', an article by historian Len Charlton. 'The Narrative of the Victoria Hall Disaster', published in 1883 by 'The Sunderland Herald and Daily Post'. While the text in the column at right comes from 'The Annual Register' for the year 1883, available as a 'Google' book here.. In the mid 1800s, Edward Backhouse was famous in Sunderland for his philanthropy. He was a partner in the family banking firm & worked as a Quaker Minister. One of the founders of the 'Sunderland Echo', he was committed to charitable & temperance work particularly amongst the poor in the East End of the city. At the time,�more affluent areas were developing round Fawcett Street. And in 1870, after seeing a need for a new public hall, a site was chosen off Borough Road next to Mowbray Park, at the corner of Toward Road & Laura Street & the Backhouse family funded the building of Victoria Hall. Built in Gothic style, the hall was mainly used for social, political & religious meetings until 1883 when, as a treat for poor children, there would be a show with penny tickets. Edward Backhouse had died four years earlier but he would surely have approved�his trustees' decision. Jun. 16, 1883 was the great day which dawned bright & sunny. Some 2000 boys and girls had each paid their penny (1d) to see the variety show put on that Saturday afternoon by travelling entertainers Mr. Fay & his wife - with a present promised for every child at the end. In mounting excitement they watched the conjurers, magicians, marionettes & illusionists. For his finale, Fay 'hatched' pigeons & allowed them to fly around the hall. At last sweets were thrown to the children & the presents started being distributed. The children in the stalls ran to the stage but there were over 1000 in the gallery who couldn't wait & they stampeded down the stairs. At the bottom were two doors which could only open inwards & to make things worse one door had been locked in a partially opened mode - to check tickets on entry. After a lucky few children squeezed through the narrow space, the inevitable happened. Excitement became panic and rescuers rushing to the doors couldn't open them against a crush of bodies still piling back up the stairs. At last Frederick Graham, the caretaker, forced his way through to open another�exit and another desperate man eventually tore the bolted door off its hinges. At the Victoria Hall, Sunderland, an accident occurred involving the death of 183 children. A conjuror named Fay had been giving a performance for the children, and at its close began to scatter prizes over the hall. The children in the gallery, fearful of losing their share, rose from their seats and hurried down the stairs leading to the body of the hall. There were three flights of steps and the landing. About the middle of the lower landing was a strongly constructed swinging-door, about five feet wide, with a bolt which can be let down into a hole in the floor, so as to keep it ajar to the extent of twenty-two inches. The object of this arrangement is, of course, to prevent more than one person from passing the ticket-taker at once. Whether any of the children, when they reached this door, got through it, is not known. It is probable that two attempted to go through the outlet at once, that they stuck in the narrow way, and others pressed upon them from behind, and that perhaps a third was blocked in the opening. The place was then impassable, and while it was so the children, eight or nine hundred strong, came bearing down from the gallery behind them. There was no panic, no alarm, no shout of "Fire!" or "Thieves!" it was simply a rush down to gain the desired presents. The door prevented the egress of any of the children from below, and the hundreds coming fast from the corridors above set up a block on the small landing between the door and the upper flight of steps. Within four yards of this spot there was absolute safety, and hundreds of children stood there in comfort; but the small, open space intervening between the stairs and the walls and door was a veritable shambles. Children were tumbled head over heels, one on the top of the other. But it was too late and by the end of the day 183 children aged between 3 and 14 were dead, laid out in rows to be identified by distraught parents running there from all over the town. 114 boys and 69 girls lost their lives that day. Perhaps a hundred more were injured. The town was traumatised by the disaster and the many days of funerals which followed. Some families had lost two or even more children and there were endless tragic stories of lost children and broken families. The Hall was boarded up and public donations raised money to build a marble memorial of a mother holding a dead child which, placed nearby in Mowbray Park, did nothing to help the hall's future. At left is a reduced size version of a fine & much larger image of the monument made available to Wikipedia Commons by 'barliner'. Thanks so much 'barliner'! Another image of the monument, is available here, provided by Sunderland City Council. It used to be available in a giant size, but no longer (though I have retained it for interested parties). And a fine image of the inscription on its base is next, (ex 'theunderstudy', thanks!, Flickr). Although Victoria Hall was extended & reopened in 1906 as the 'Alexandra Hall' with the intention of providing wider entertainment, the tragedy had damned it, audiences wouldn't go there, & artists wouldn't play there. There was, not surprisingly, wide-spread relief in 1941 when a German 'parachute-mine' completely demolished it! Webmaster's addition. Anne from England advises that her father was coming home on leave from the Royal Navy in 1941, and on coming out of Sunderland railway station, he saw the parachute bomb which wrecked the Victoria Hall, floating down. Anne remembers him saying "I ran like hell!" After the war, the vandalised memorial was moved from the remaining bomb wreckage to Bishopwearmouth Cemetery but it has now been replaced near its original position in a brand new enclosure (visible above). The legacy from the Victoria Hall tragedy was in the legislation which was then passed enforcing outward opening doors with push-bars in all public areas. The Backhouse family is remembered in Sunderland by the attractive Backhouse Park off Ryhope Road which is on land bequeathed to the town by Edward Backhouse on his death. i) a 'pdf' file provided by the Sunderland Public Library Service' that includes fine images both of the marble memorial & of the building after its bombing in 1941 (as above). ii) a fine account of the disaster. iii) a list of the names of 181 at least of the 183 children that died. One family sadly lost 4 children. I wonder why all of the 183 names are not today known. Can anyone explain? And another list that may be of assistance also, thanks to Brian Pears, with the latest (Aug. 2011) research by Alan Vickers available both at page bottom & also here. It would seem that the number of children who died that day may be, in fact, 'quite a few' more than 183 & perhaps close to 190.
iv) a New York Times article of Jun. 18, 1883. Sad reading indeed. v) an interesting account (pages 1 & 2) of the disaster. There seems to be scarcity of WWW available images re what was truly a major disaster in world history let alone Sunderland or English history. And little data about the 'Fays'. The data that the webmaster knows about them is lower on this page i.e. here. Since the above words were written, two site visitors have contacted the webmaster & have most kindly provided additional material. Anne Johnson has provided beautiful photocopies of cover pages from each of the Jun. 23, 1883 issues of 'The Graphic' & 'Illustrated London News'. The images those pages contain & the related texts, are now visible below. I learn that Albert Anderson wrote a book entitled 'The Victoria Hall Disaster', published by Black Cat� Publications in 2009. ISBN #1899560688. I read (thanks to Sunderland Echo) that Sunderland Corporation bought the hall for �8,000 & spent �30,000 enlarging the theatre. It re-opened on Nov. 7, 1906. The second response was received from Margaret Hartford, today of Nottingham, but originally from Sunderland, where she was, before marriage, Margaret Graham. Margaret advises me that her great grandfather�s brother, one Frederick Graham, was the manager of Victoria Hall at the time of the disaster & was a prime witness at the Coroners Inquest. Margaret has provided three articles about the disaster that were printed in the London Times in Jun/Jul 1883. I invite you to read the texts that I now make available. But ... do please be warned. The story is very sad & in the first article of the three, the events are set out in very great detail. In all of its graphic horror. While not happy reading, it does tell us most clearly what actually happened that fateful day long ago. The largest article, available here, sets out the whole heartbreaking story. It is very large indeed & may take time to fully download. Articles 2 & 3, available here & here, refer to the Coroners Inquest & to the verdict of the Coroner's Jury. The dates of publication of those 3 articles are, in numeric sequence, Jun. 18, Jul. 3 & Jul. 5, all in 1883, of course. Margaret, we thank you so much for making this wonderful material widely available, as you have. I have read that a lady named Georgina Whellans, probably from the U.K. & maybe from Sunderland, has an old newspaper which reports upon the disaster. It would be good to learn about the coverage it contains. I now know that the print at the top of the page & the left image that follows were from 'The Illustrated London News' specifically the issues dated Jun. 23 & Jun. 30, 1883. Both indeed were on the front covers, as you can see here. The disaster was also on the front page of 'The Graphic' of Jun. 23, 1883. The image at right below is a part only of an early postcard. The full width image below, showing Alexander Fay at centre stage, is also from this 'The Graphic' page. The disaster was reported in the French illustrated paper, 'Le Journal Illustr�', in its issue #27 of 1883, dated Sunday, July 1, 1883. The text of that article follows, together with the webmaster's attempt at its translation into English. Now usually I am able, with the assistance of a WWW translation site, to effect a good translation ... but this translation proved to be most difficult. So corrections or improvements in the translation below are invited. The issue also contained an interesting illustration, which seems however to depict the scene quite incorrectly. But the illustration is worthy of inclusion, can be seen below, but should soon be available in better quality. Enjoy! Le samedi 16 juin, une terrible catastrophe plongeait la ville de Sunderland dans le deuil. M. Fay, professeur de prestidigitation, donnait un grand spectacle enfantin a prix r�duit. La modicit� du prix (un penny : 10 centimes) avait attir� une affluence consid�rable; le nombre des enfants pr�sents �tait de plus de douze cents. Apr�s les exercises de prestidigitation, on annon�a une distribution de livres, jouets, etc., et les enfants qui occupaient la galerie se h�t�rent de descendre au parterre afin d'�tre plus pr�s de l'estrade o� se trouvaient les lots. Au bas de l'escalier, �tait une porte � deux vantaux, dont un seul vantail �tait ouvert, ne permettant le passage que un � un; une bousculade en est r�sult�e et un grand nombre d'enfants ont �t� renvers�s et foul�s aux pieds. Avant qu'il ait �t� possible de leur porter secours, une centaine d'enfants gisaient �touff�s par leurs camarades, qui ne pouvaient r�sister a la pouss�e venant derri�re eux. On put enfin arr�ter les enfants qui continuaient � descendre et qui n'avaient aucune conscience de ce qui se passait. Des t�moins oculaires rapportent qu'� ce moment, l'entr�e de las salle pr�sentait un spectacle horrible a voir. On sortit un � un, par la porte � moiti� ouverte, let petits corps qui s'�taient amoncel�s dans l' escalier. Ces corps s'�taient amoncel�s en couches profondes de huit ou dix. On les passait � des m�decins qui, apres examen, les dirigeaient sur l'infirmerie, s'ils n'�taient que bless�s, ou sur la vestaire, s'ils �taient morts. Bient�t, on eut rassembl� 186 cadavres. Un grand nombre d'autres enfants avaient re�u de graves contusions. Les plus �g�s entre les morts n'avaient pas 13 ans. Ces victimes appartiennent aux deux sexes. Les visages �taient presque tous gonfl�s et violac�s. D'autres avaient gard� leurs couleurs naturelles et semblaient dormir. D'autres �taient tout meurtris et sanglants. La reconnaissance a donn� lieu � des sc�nes d�chirantes. Ceux qui en ont �t� t�moins les auront toujours devant les yeux. Une foule �valuee � plus de 20,000 personnes n'a cess� de stationner, pendant toute la soir�e, dans le visinage du lieu du sinistre. Toute la ville �tait dans la consternation. Une enqu�te s�v�re a �t� imm�diatenent ordonn�e. Tous les journaux anglais sesont accord�s a dire que las catastrophe aurait pu �tre �vit�e si l'on avait pris les pr�cautions ordinaires en pareil cas, et si las police avait �t� charg�e de maintenir l'ordre a la sortie des enfants. Il parait, en effet, qu'il n'y avait dans la salle qu'un tout petit nombres de femmes, incapables de diriger des enfants au d�part, et il est hors de doute que dans l'escalier il n'y avait personne pour r�gler leur marche. Apr�s les incendies des th��tres de Nice et de Vienne, la catastrophe de Sunderland est unique dans son genre, et on ne sait rien qui puisse lui �tre compar�. On Saturday, June 16th, a terrible disaster plunged the city of Sunderland into mourning. Mr. Fay, a conjurer, presented a grand show for the children at a modest ticket price. That price (a penny: 10 centimes) attracted a very large audience; more than 1200 children were present. At the end of the show, it was announced that books, toys, etc., would be distributed and the children who occupied the gallery hastened to go downstairs to receive their gifts. At the bottom of the staircase was an exit with two doors, only one of which doors was open, allowing the passage of children only one at a time; a melee resulted and a great number of the children were trampled underfoot. Before it was possible to help them, a hundred children lay dead, trampled by their comrades who could not resist the pressure coming from behind them. Nothing could stop the later children from continuing to descend unaware of what had happened below. Eyewitnesses report that the scene presented a horrible spectacle. Through the half-opened door one could see the children's small bodies, lying crushed at the bottom of the staircase. The bodies were in a pile eight or ten deep. One by one they were passed out to the doctors who examined them and directed them for treatment if they were hurt or to the vestry if they had died. Soon, 186 corpses were laid out. A great number of the children has been seriously injured. The oldest were less than 13 years old. The victims were of both sexes. Many faces were bloated and purple in colour. Others had kept their natural colours and seemed to be sleeping. Some were ravaged and bloody. The scene was heart rending & tears flowed. Those who were present will never forget the scene. A crowd of over 20,000 people gathered through the evening at the disaster scene. All the city was in consternation. An investigation was immediately ordered. All of the English newspapers stated that the catastrophe could have been prevented if only ordinary precautions had been taken or if police had been there to maintain order when the children exited. It would appear that there were only a small number of women in the hall, unable to direct the children at the beginning of the show. And nobody was in the staircase to regulate the children's departure. Even considering the fires of the theatres of Nice & Vienna, the Sunderland catastrophe is unique. Nothing comes to mind with which it can be compared. A sad scene today in the Mere Knolls cemetery - the gravestones of three of the young disaster victims. At left of sisters Ann Milner & Margaret Milner Pringle, aged 9 & 7 years respectively - and, inset at right, of Charles Foster Dodds, aged 8 1/2. We thank Alan Vickers for the fine images. 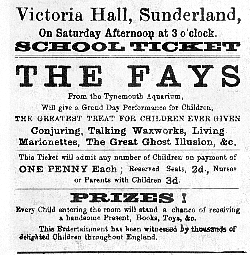 The 'Fays' show would seem to have been performed at many venues in England - & the 'ticket' above indicates they were from Tynemouth Aquarium. I have read that they were Alexander Fay, a conjurer, & his wife 'Miss Annie Fay'. We can now tell you a little more about the 'Fays', thanks to the kindness of Mr. Dean Arnold, of London. Dean, the librarian for 'The Magic Circle', is currently researching the 'Fays'. If you have information that would help in that research, Dean would be delighted to hear from you. You might contact Dean through the webmaster, who will pass your comments on. The splendid image immediately above is available in a much larger size. Here. According to his own testimony given at the inquiry into the Victoria Hall Disaster, Alexander Fay began performing around 1875 & just prior to the tragedy, had been staying with his brother in Tynemouth. In the 1881 census we find a Mr. Alexander Fay, along with Annie Fay, staying at a boarding house in Lancashire. He lists his occupation as 'Ventriloquist and Performer', age 30 (making his birth date around 1851) & his place of birth as London, Middlesex. In a note now at the Harvard Library, a note dated Mar. 16, 1883, he is seeking an engagement at the Brighton Aquarium. In his letter to management, he mentions that he spent five months in the previous year performing with greatest success at the Blackpool Winter Gardens & Southport Gardens. It would appear that the Fays continued to perform after the Victoria Hall tragedy. A copy of a handbill from around 1886/7 has them performing their act at the Town Hall in Bermondsey, in east London. Alexander again shows up in the 1901 census, age 50, as a boarder in a house in Coventry. This time he is staying with Nellie Fay, age 25, Eveline Fay, age 3, & Lillian Fay, age 1.�He lists his occupation as 'Public Entertainer'. He would appear to surface again in the 1911 census as a boarder in Barnsley (the other residents are all music hall artists). This time however the age is not quite right, 58 (but he may be trying to trim a few years off!) & his occupation is 'Entertainer'. But now he is widowed. An article in The World�s Fair magazine from 1936, relayed a letter from one its readers about magicians of the previous century. Toward the end of the article, the author mentions seeing Alexander Fay & Miss Annie Fay, describes their act & then says 'Poverty overtook Fay and he died in Leeds Workhouse'. In late August 2011, Dean Arnold has been further in touch, to advise that he believes that the true identity of Alexander Fay is now most likely established. The following are Dean's words. I was initially unable to find any birth records for an Alexander and/or Annie Fay.�I had my strong suspicions that Fay was not their real name, but rather a stage name. The big breakthrough to the true identity of Alexander Fay came from a fellow magic historian and researcher Gary Hunt.�In his research for a book he is preparing on Gustave Fasola, a contemporary of Fay who had actually worked for Fay at one point, Gary came across a notice that appeared in Volume 29 of The Commercial Gazette on January 12, 1882.�It announced that a John Butters on the 30th of December had loaned �60 to one Alfred Hutchinson, then staying at Trinity-buildings, Dewsbury.�It lists Alfred Hutchinson�s trade as 'professor of conjuring' and also states that Alfred Hutchinson is 'commonly known as Alexander Fay'.�It would appear that the loan was secured against Fay�s 'conjuring appliances'. This information led me to find the birth certificate of one Alfred Hutchinson, born the 14th of July, 1851 to William and Mary Hutchison at 7 White Horse Lane, in Lower Mile End Old Town, in the county of Middlesex.�Alfred�s father�s occupation is listed as a chemist. Through various additional research, I am reasonably convinced that this is our man Alexander.�However, I am continuing my research into the Hutchinson family as well as Annie. Bravo, Dean, a breakthrough indeed! Dean continues to seek more information. If you can add to the knowledge of the 'Fays' or of their show, or can provide more data or images about the whole subject, do please contact the webmaster. That others can better appreciate & understand the tragedy. The following has been kindly written for the site by Len Charlton. As a child in the 1920s, I was often told of the horrors of 1883. Any mention of Victoria Hall seemed to reopen the story of� 'that show' & as far as I was�concerned the Alexandra�Hall was just another name�for the same place which was to be avoided. My family showed no interest in what 'was on' there &�I grew up�with a vague idea that the hall�was just for public meetings - until the late 1930s, when I went there to see a 'big band' show. The plain inside of the hall seemed a far cry from�the nearby richly furnished,�colourful�theatres & cinemas�&�not surprisingly the show�lacked�any appeal for me.�Now, many years later,�recalling memories of Sunderland so often touches on the Victoria Hall tragedy that I began to wonder about the�history of the building itself�& what it was really used for. 'Victoria Hall' was built beside Mowbray Park, which in 1866 had opened in the centre of the prosperous new town of Sunderland, almost a mile west of the old town & docks. There was a need for a Town Hall to replace the old Exchange Building in High Street East which had served well but which was now far too small. The Backhouse family, bankers & staunch Quakers, who had already financed many charitable institutions in Sunderland, were soon involved. Edward Backhouse agreed on the site in 1870 (at right) but he wanted the new hall to be used for public social, political & religious events rather than for civil administration. Suitable plans were soon prepared�& two years later anyone strolling in the park could look over the lake & fountain & see what looked like a large Gothic Church facing the park. 'The Victoria Hall and Temperance Institute' was built on a slip of land between Toward Road (also known as Park Terrace) which bordered the east perimeter of the park & Laura Street running behind. The main front facade was heavily Gothic in style with full height windows & this was matched by the back facade on Laura Street. The hall had cost �9,500 to build, but it looked as though money or time had run out because, although the south gable wall was partly hidden by the end of a terrace of houses which it adjoined, the north gable plain brick wall was a very visible eyesore. Sometimes covered with advertisements - some early photos even show make believe church-like windows roughly painted on. There are few records of the meetings & events that took place in the first ten years of the hall's life, but one can be sure they followed the strict temperance & religious codes of the Quakers. Mr Fay's show in 1883, with presents promised for poor children, would no doubt have greatly appealed to Edward Backhouse who had, in fact, died in 1879. But even he could never have foreseen the terrible outcome of that promise. The 1883 engravings in 'Illustrated London News' & in 'The Graphic' are descriptive & harrowing, most particularly of the crowds panicking around the back entrance on Laura Street. The hall closed after the tragedy, which was reported world-wide. But the eventual re-opening of the hall with changed doors & access is rarely mentioned & indeed little is known of the bookings during the rest of that century. However the death of Queen Victoria in 1901 & the accession of Queen Alexandra offered a golden opportunity to revitalise the disliked & ageing building. The hall which had room for 2,500 seated & 500 standing was in truth too big for many events & there was unused land to the north of the old hall. So why not extend the old building to form an extra smaller hall to be called Alexandra Hall? This was a convenient arrangement because Toward Road & Laura Street, running north/south, gradually come together making the site a narrowing strip of land. In fact, although the southern end of the old hall was some 150 ft. wide, the northern end where the stage was placed was only 110 ft. wide. (external measurements). A new hall, added to the north end, would continue to narrow to about 60 ft. at the top &�so have room for�fewer seats. Though slightly different in design to the old building, Alexandra Hall joined on very well to produce a facade twice as long as the original Victoria Hall. The unsightly flat north wall of the old Victoria Hall had disappeared but the much narrower north end of the new Alexandra Hall had to be finished off. This was done in the form of a stylish six-sided tower which fitted neatly into the narrow north end of the building plot. During this rebuild, the southern gable of the old hall was also extended, with a square tower matching the Gothic facade & a revised roof line behind. The two halls with their different towers filled the site completely & the new building was opened in 1906. The extensions had left the original hall itself largely unchanged & the terrible tragedy of 1883 continued to blight the�new elongated building which, it was bitterly said, was 'shaped like the coffin it once was'. None-the-less, there was soon a continual flow of a very wide range of bookings. including concerts, variety shows, plays, political speeches, religious services & public meetings, many of the latter becoming over-crowded & noisy. Amongst the more famous speakers was Emily Pankhurst, who in Feb. 1912 spoke at a meeting defending suffragettes. Greeted with 'thunderous applause' when she started, catcalls, rattles, horns & stink bombs made her speech inaudible until the police ejected the trouble-makers. At left, Emily Pankhurst speaks at a similar meeting, held at Hull. As a result of the suffragette movement, over a third of Sunderland's voters in the 1918 General Election were women who had attended a pre-election meeting in Alexandra Hall, held by one of the candidates, Ralph Hudson. He had supported their demands & the meeting virtually ensured his return to Parliament. Many of these large public meetings caused trouble. In 1912, Sunderland was suffering civil unrest from a strong Anti-Mormon group & in May of that year a meeting was held in Victoria Hall with the Mayor, senior council & administrative figures present (image above). The packed meeting condemned the teaching of Mormonism & agreed to do all in its power to 'prohibit its pernicious influence'. Only one objector was heard & he was shouted down. This meeting turned the general unrest in the town into violence, with Mormon Church services becoming threatened by crowds of several thousand people & witch-hunts started on individual�Mormons - until the American Consul claimed damages under the Riot Act. In Jun. 1912, a second Victoria Hall meeting 'The Anti-Mormon Campaign' was held, the Mayor notably being absent this time, with the result that street violence escalated to such a degree that police had to be flooded in. On one occasion over 100 police confronted 5,000 rioters but this hard response seems to have worked, & by Aug. 1912 the riots had ended. The hall was also frequently used by local talent such as the Sunderland Drama Club. In 1922, a group of 14 people presented Somerset Maughan's 'Jack Straw' to public approbation. And then, calling themselves Sunderland Thespians, they used various church halls until, in 1925, the group, now expanded to 34 & renamed Sunderland Drama Club, presented 'The Tempest' at Victoria Hall. Membership grew rapidly & their varied productions attracted big audiences. In 1932, they bought a house behind Victoria Hall & converted it into 'The Little Theatre' to use as a club house, no doubt with temperance rules relaxed. The bomb that was to destroy Victoria Hall destroyed the club house in 1941, but the Drama Club survived the war & now runs the Royalty Theatre near Burn Park. Occasionally a local 'character' appeared on stage, one such being Thomas McGregor, a singing comedian of Sunderland birth, whose popularity was further enhanced when, with Florence Atkinson of Seaham, they were crowned King & Queen of the annual East End carnival. Victoria Hall seemed to be all things to all people but too many still saw the ghosts of the dead children & even in the late 1930s when I went to see a 'Jack Payne's Big Band Show' my mother commented on 'how wrong it all seemed'. At the start of WW2, it was used for wartime distributions (gas-masks, ration books etc.) & administration, & it was where I went in Mar. 1941 for my medical examination & service selection.�On the night of Apl. 15/16, 1941, waiting for my posting,�I�was at home�when Sunderland suffered a devastating air-raid during which many bombs & four parachute mines fell on the town centre. At about 3 a.m., a very loud bang marked one of those four parachute mines landed spot on Alexandra Hall. It was completely destroyed & the adjacent Victoria Hall was reduced to a skeleton with only the South Tower left standing. When the remains were eventually cleared up, the tower was also�demolished & the site�remained�unused for some time. Meanwhile, the Childrens' Memorial�had been�moved from Mowbray Park to Bishopwearmouth Cemetery, alongside many of the childrens' graves, but without�a canopy. It was continually vandalised until 2002 when the marble statue was repaired & returned to its place in�the park under a new canopy. Today there is a�'Victims�Support Centre'�(for today's victims of crime)�on the old site but�it is�the memorial that serves as the�real reminder of one of Sunderland's most controversial & infamous buildings. At left below a fine 1930s photograph of Toward Street and Victoria Hall. An image which would merit being shown much larger should that ever prove to be possible. A 'monkwearmouth' eBay item in May 2012. And at right, part of a 1931 postcard image, also ex eBay, of the War Memorial with Victoria Hall in the background. And next a fine postcard image of Victoria Hall and the lake - that dates from 1913. Click the image to view it in a larger size. A second page re the Victoria Hall disaster - 029.